Some orchids make me wish I had better eyesight and this is one of them. Platystele stenostachya is a mini-miniature found all the way from Mexico in the north to Peru in the South. It has been reported from sea level up to 1700m and with such a range is not surprisingly a variable species in terms of flower colour and shape. Our plants have tiny golden star like flowers with a deep orange lip. The species is almost always in flower and a really interesting addition to any collection. 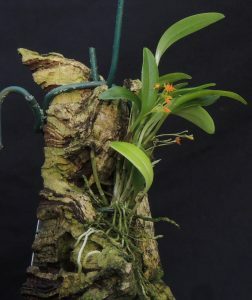 The species is a tough little grower and produces lots of roots suggesting it can cope in dryer conditions that a lot of the tiny members of the pleurothallis family.